This conference took as its starting point the observation that the public is increasingly being given access to material that was never originally meant for its eyes. From film extras added to collector’s edition DVDs to sensitive governmental files declassified by laws like the Freedom of Information Act, this once-restricted material has significantly contributed to an attitude that questions not only the process behind a ‘text’s’ construction but also its claim of being whole/complete/finished upon publication. Moreover, such popularizing of debate regarding the significance of material ‘left out’ of original publications/releases represents an extension of a scholarly debate on such matters that has grown in importance with the increasing availability of archival materials relating to canonical authors and important historical events. 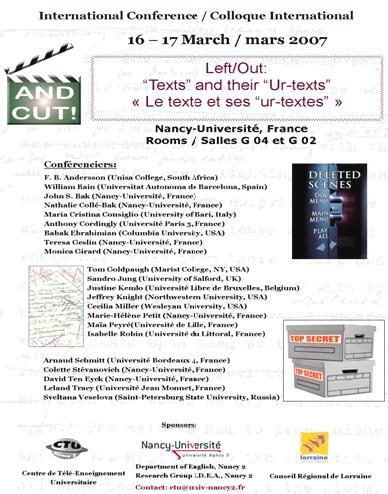 ‘Left/Out: Texts and their Ur-texts’ brought together twenty scholars from France (Bordeaux 4, Paris 3, Besançon, l’Université du Littoral and St. Etienne, as well as Nancy 2), other European countries (Spain, Belgium, Italy and the United Kingdom) and the United States. For the most part, the presentations given at the conference were in the fields of literary studies and film studies. A concluding round table offered the occasion to summarize the different analytical approaches present in the panel sessions. The Left/Out conference initiated a sustained study of questions related to archival research, textual scholarship and book history within the IDEA research team. This research work has, in the years that followed the organization of the event, given rise to the organization of two further conferences: Lives of the Book (2008) and From Text(s) to Book(s) (2012), and the restructuring of the IDEA’s literary research, so as to include a specific focus on textual scholarship, as indicated by the name of the Literature and Textual Studies research axis. A collection of peer-reviewed and revised articles based on the presentations given at the conference was published by the Presses Universitaires de Nancy: Left Out: Texts and Ur-texts (2009).